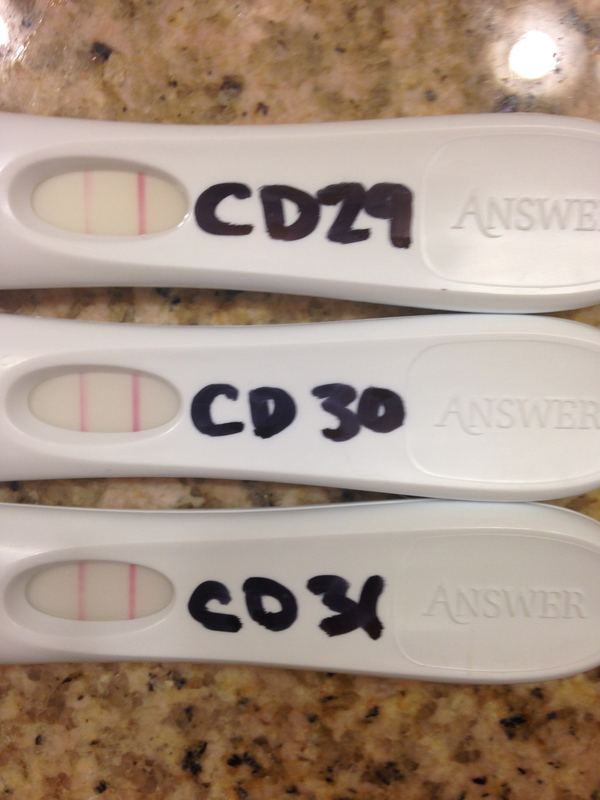 It’s CD 31 and I think I may have finally had my LH surge!! I’m not for sure because the test line was still lighter than the control line…it’s just so close though. I ran out of my ClearBlue digital tests a couple of days ago so I couldn’t test with those as my backup. Of course the days where I actually might be ovulating I run out of my tests. Such is my luck! Yesterday and today were the darkest lines I have seen though so I am thinking that these days may have been my best chances to get pregnant. I am going to keep testing with my OPKs and see if I get a no doubt positive though up until AF shows up. That brings me to my cycle day length. I am thinking I must still be on an irregular cycle because if I had a 28-day cycle then AF would’ve shown up at the beginning of this week. I did take a pregnancy test today though since there was no sign of the “lovely” lady. It was negative. A BFN! I kind of expected this since my OPKS have been looking pretty close to positive but I just couldn’t help but take a test. My POAS addict ladies will understand! My last cycle was over 60 days though because I started on September 1st and then my next period didn’t happen until November 3rd. I was really hoping that this cycle would go back to a regular one but it’s seeming very unlikely. I don’t know if I should expect AF next week or the week after so I’ll probably take another pregnancy test next week. I’m still hoping we get lucky and conceive on this cycle! I have a vlog up on my YouTube channel if you want to check that out too.